Revamped Studio – now it’s time to get back into production. After my last post, or the one before that, I mentioned it was time to tidy and organise my space. I wouldn’t mind having to do this so much, but I have limited wall space to use. So I get all growly and upset. Let’s see what I have to work with. There is a fire place, but it has shelves above meaning I can’t block it off. That and the fact heating is so darned expensive I want to light the fire instead. There are two doorways, two low windows – lovely natural light not to be messed with, and only one large wall space – which has to go to my mega bookshelf full of beads. The other wall, has a heater – which in a stupid place means I have little room either side to use. Then I also have to share it with a low bookcase full of books, and the buffet which is ‘family’ space. The shelving unit of cubes was meant to be in the kitchen but it was too wide so I swapped it over (they both work much better in their new home) both filing cabinets have moved and I am now using 2 desks instead of one. This makes it slightly squishy when getting beads, but I can easily move the table if I need to. And it covers the heater I don’t want to use. As you can see there is not a lot of room to move, but I am trying to make the most of the space without feeling closed in and messy. basket of findings, rings, crimps etc. Spare table, with paints and misc bits tidyily tucked underneath. as you can see, ugly, and completley wrong, but it is doing the job I want it to. More info on this item in a new post on Mother, Beader & Coffee Lover. Check link on the side bar. my sewing desk, and four market boxes on the right hand side. beading corner. Wall of beads on the right. filing cabinets and new shelf. And with a market coming up this week (& the 27th) then the Annual Middleton Expo early Feb, I had better get moving and make a few new and bright items. 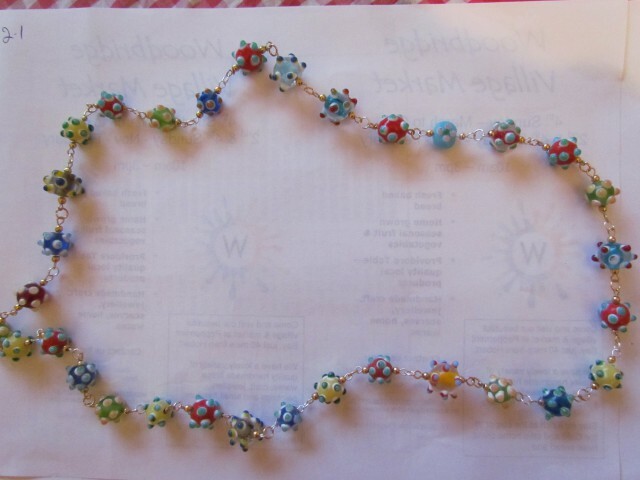 This entry was posted in Misc craft posts, Studio and tagged arts, Beads, cabinets, Expo, illustration, MIddleton, organisation, shelves, studio, tables. Bookmark the permalink.